For some time, it’s been apparent that just as climate change is killing some species, it’s making room for others to expand, or fostering creation of new species  altogether via hybridization. In the Arctic, hybridization is a particular problem for conservationists trying to save unique species from extinction. Take the magnificent polar bear:�with thick white fur over black skin, and blubber up to 5″�thick, the animal is well-adapted to a cold environment. But as temperatures climb and animals begin to roam, it’s interacting (and breeding) with species it would have rarely encountered before. In 2006 a hunter killed an animal that was found to be half grizzly and half polar bear, the first known “grolar bear.” Another grizzly-polar hybrid was killed in April :�DNA tests showed that not only was it a hybrid, it was a second-generation mix. Its mother was a “grolar” that had mated with a male grizzly bear, scientists said . Some have called it a “pizzly” to denote both its hybrid status and to differentiate it from the half polar-half grizzly “grolar.” Bears aren’t the only Arctic mammals creating hybrid offspring: biologists have evidence of harp seals mating with hooded seals, and narwhals mating with belugas. I would counter that although yes, it is upsetting species are going extinct, hybridization is a natural process and can eventually create new species. In the case of mammals with long life spans, the creation of new species will take quite a while since each generation may last 30 years. 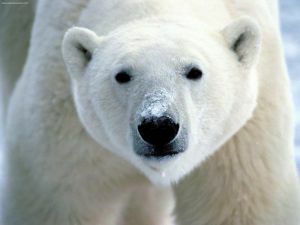 And for the polar bear, that is simply time it doesn’t have. As Kelly put it,  “This change is happening so rapidly that it doesn’t bode well for adaptive responses.” Kelly has recommended culling hybrids when feasible, but the best thing for Arctic species, he’s said, is reducing carbon emissions. « Corn Syrup Happy Urban Bee’s Feast on Artificial Flavor. Posted on 12.29.10	to articles. Subscribe to follow comments on this post. No comments yet. Add your thoughts or trackback from your own site.